Dr. Alden accepts most insurance plans. Additionally, if Dr. Alden does not participate with your insurance plan, Dr. Alden’s office is frequently able to obtain pre-authorization from your insurance plan based on his uniqueness of his specialty. We will contact your insurance company to understand your benefits and additionally submit for you. You will enjoy the luxury and benefit of academic medicine in a top rated concierge environment without the hassle of long hospital waiting room times and paperwork. Most policies reimburse patients for most of the cost of surgery. Our surgical coordinator will help you with a quote. If you have healthcare insurance, most health care benefit plans provide “out-of-network” medical and surgical benefits for there members. With out-of-network benefits, members are entitled to payment for covered expenses if they use specialized doctors and other health care professionals outside of the network. You will enjoy the luxury and benefit of our best in class individualized treatment protocols customized to your disease, your body, your DNA. We offer the finest in academic medicine in a top rated concierge environment without the hassle of long hospital waiting room times and paperwork. 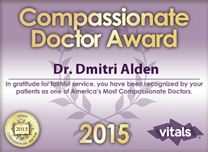 Please note: A doctor’s referral is NOT necessary from a General Practitioner to see Dr. Dmitri Alden for a consultation, 2nd opinion, or for treatment at our practice. We will be happy to contact your health insurance on your behalf and assist you in filling out and filling all the paperwork. To minimize concern about your insurance or financial responsibility, our Billing Staff will be happy to assist you with any questions, please call our office. YOU ARE RESPONSIBLE FOR ANY DEDUCTIBLE OR CO-PAYMENTS THAT YOUR INSURANCE COMPANY DOES NOT PAY. * Dr. Alden offers remote consultations to patients and medical professionals anywhere in the world via phone or SKYPE. Please follow this link to learn more: remote consultations. Please phone Dr. Dmitri Alden’s office (212) 434-6216 for details pertaining to remote consultations or make a consultation using the eForm on the right. For more information or to make a private consultation please feel free to contact the NYC Liver, Pancreatic & Bile Duct Oncological Surgeon, Dmitri Alden, MD, FACS, today by phoning his New York office (212) 434-6216 or using the eForm to the right to contact the surgeon.